I think everyone's mind turns to making some toys for their budgie at some point, so I have made a list of easy homemade toys. "With DIY toys you always need to apply the safety check list mentioned above (“Is it too big, too sharp, a potential trap, or toxic?”); but once you’ve ticked them all off you can make anything from a simple chew to an assault course. If you’re using wood in your toys, wash it first in warm soapy water, rinse it, and dry it thoroughly. Wet wood is a breeding ground for bacteria, and that’s something you don’t want to be introducing into your birdcage"
Twist some twigs and/or dried grass together. Your budgie will spend hours undoing all your good work… but that’s the whole idea. Hide some millet spray inside for a piñata effect. Drill holes in disks or chunks of balsa and pass a rust-proof skewer or long bolt through them to form a climbing/swinging tower. If using a skewer, ensure the sharp end is screwed into some hard wood. Hang it from the top of the cage. Get a thick piece of wood and drill holes at different heights and angles, matching the diameter of wooden doweling rods. Poke the doweling through the larger piece of wood, and secure your creation to the side of the cage with a plastic zip tie or eye-hook, resting the other end on the cage bottom. Wooden spools (with the thread removed, of course) make safe and fun playthings for birds of all sizes. 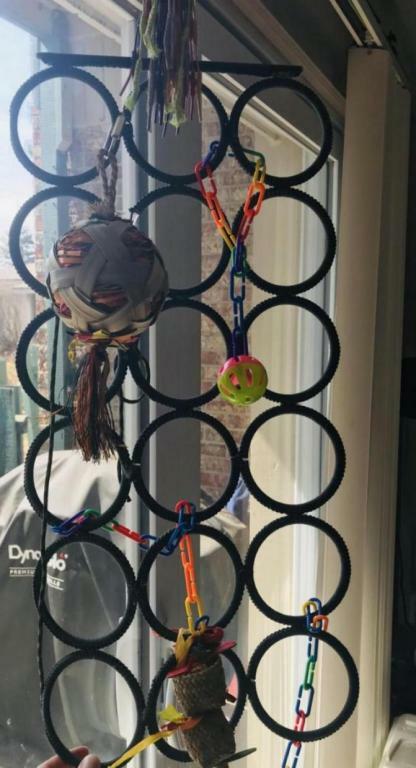 Some owners use spools as foot toys that their birds can play with while out of their cages, and some string spools of cotton twine or vegetable tanned leather to hang on their pets' cage bars. You could make swings or anything, it depends on your creativity! Birds can have a ball playing with plastic poker chips. They can be strung on a rope to create hanging toys, but you can use them as foot toys with your birds. They will pick them up, roll them around, throw them in the air and chew on them. Because poker chips can be very thin, you should always supervise your pet when playing with them. Birds that are strong chewers could choke if they bit off a small piece of the chip, so be sure to replace the chips if you notice them becoming worn or ragged. Paper may seem like a dull choice for a bird toy, but many birds are happy to shred the day away with a fabulous paper plaything. Using plain paper with no dyes on it, you can cut shapes for your bird to shred, weave paper strips in and out of your bird's cage bars, or simply crumple it into a ball and let your pet play away! Birds love to rip their way through the yellowed pages of books you're never going to read again.. you could get some cheap ones specially from car boot sales! Please give ideas if you have any others!! Thanks for giving some great ideas However, I would NOT recommend letting your budgies chew on old books, as the ink that is used for printing them may not be non-toxic. I'd also be afraid of the glue that holds the binding in place. The best and cheapest toy that by birds love is a balled up piece of paper. I like to tuck bits of millet in it, so it's a shredding toy AND a foraging toy too! I can spend so much $$$ on expensive toys that they ignore for weeks, but as soon as a new ball of paper goes it, they are all over it! lol, silly birds. This is an awesome list - thank you! I'm about to be a new budgie owner and am still in need of enrichment toys. But I also agree that while the book is a great idea since they don't actually eat the paper, but I don't want it to think that all books are fair game. Also, with “old” books, you never know if the old paper is harboring microscopic areas of mold or fungi, as can happen in old paper. As mentioned, be sure to check if materials have been exposed to or made with chemicals, paints, lacquers, or pesticides. It’s up to pet parents to be sure to use common sense with toys. Even store bought toys aren’t always safe, and we need to inspect them to see if they’re appropriate in materials and size for our birds. I do agree with the old book comments above though. My scarf hanger from Ikea. They basically claimed it as a perch and jungle gym. So now we put lots of different DIY toys and even store-bought ones on it. Can easily make one of these too, or rewrap it when they destroy the string- and they will! Kind of a DIY play area! Seems like it would work to hold some of your ideas! Last edited by FaeryBee; 03-25-2019 at 08:37 PM. This is a spectacular idea! BRB, I'm going to Ikea!